The boys from Detroit/Missoula-based American Expedition Vehicles (AEV) are in Moab, Utah this week for the annual Moab Easter Jeep Safari. The boys from Detroit/Missoula-based American Expedition Vehicles (AEV) are in Moab, Utah this week for the annual Moab Easter Jeep Safari. AEV Principal Michael Chetcuti will blog daily from Moab, where off-road Jeepers descend by the thousands to ride the legendary, challenging, and breathtaking red-rocks terrain. Day-long organized trail runs culminate in a huge Saturday ride always the day before Easter. Out here at the Moab Easter Jeep Safari, we work hard and play hard. We meet with press people and customers, and then we get to ride these legendary trails. It’s an absolute blast, but a long day on the trail can beat the crap out of you! You get bounced around, the wind blows, and the sun pounds. We get hungry! Moab may be the culinary capital of east central Utah, but that ain’t saying much. Besides, I’m big into good, healthy food and great beer and wine. As a principle in Quality Metalcraft in Livonia and American Expedition Vehicles, I am also a partner in two local Pizzeria Biga restaurants (Southfield and Royal Oak) and Cloverleaf Fine Wine of Royal Oak. Let me tell you, it’s tough to get good beer and wine in a place where Mormons don’t look too fondly on the stuff. So we bring out our own chef. Cammie Buehler is my dear friend from northern Michigan. She is a partner in the Leelanau County/Traverse City-based Epicure Catering. I’ve hired or recommended Epicure Catering for literally dozens of jobs, including several in the Detroit area. 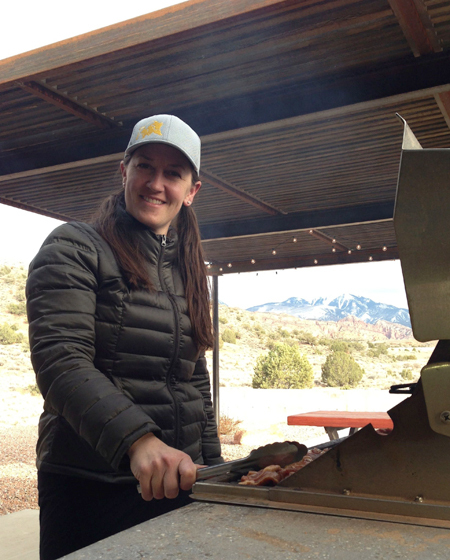 She is here with us in Moab all week, preparing customer-appreciation meals for big groups and box lunches for the guys who spend all day rock-crawling the trails of Moab. I asked Cammie about her business and how she’s enjoying her time in Moab. So, Cammie, what brings you out to Moab? Cammie: I am here to provide sustenance for the hardworking team at AEV. Cammie: It’s a great job! I’ve known you (Chet) for 20 years. I’m working all week, but it’s hard to call it “work” at times. The AEV guys are great and we have a lot of fun. The other night I fed 25 hungry, trail-weary guys. We had a blast. The guys are sweet and so grateful to have some great food and good beer and wine in a relaxed setting. Plus, today I got to hit the trail, riding shotgun in a great AEV Double Cab Brute for eight hours on the stunning Porcupine Rim Trail. Plus I meet people, which is great for my business. Tell me about Epicure Catering and Cherry Basket Farm. Cammie: Me and my business partner, Andy Schudlich, have a historic farm (Cherry Basket Farm) venue in Leelanau County, which is our home base. Extensive travels and private chef gigs, however, have given us a leg up when it comes to the logistics of cooking away from our commissary. In the off season, we often find ourselves working as travel chefs for all sorts of occasions, from duck hunts in Arkansas to weddings in Lake Tahoe. This week it happens to be the Moab Easter Jeep Safari. How does this help promote your primary business, which is catering events in the beautiful Traverse City area? Cammie: Chet, you are the master collaborator. With your food (Pizzeria Biga) and wine (Cloverleaf Fine Wine) businesses, we always have a lot to talk about. We collaborate on all sorts of projects relating to food, wine, entertaining and business. Business and entertaining go hand in hand and I meet and make contacts with people from all walks of life. AEV is at the top of their industry. We strive for this goal as well, so it is an honor to feed the team and get to know them. We love everyone in the off-road community, especially our customers, so we take it with a grain of salt that some people consider us “elitists” in the industry due to the high quality vehicles we build. Seeing as we have our own private chef to feed us this week, perhaps the elitist tag is kind of accurate. Next articleWhen Do You Kill a Dying Business?